University of Oregon's Department of Product Design set SAIL in summer 2017 with a new addition to week-long programs designed to help high school students explore career paths. A product design undergraduate student in UO's College of Design taught the next generation of designers during the Summer Academy to Inspire Learning (SAIL). That included lessons on manufacturing and fabrication of consumer products; packaging; 2D and 3D computer-aided design (CAD) tools; laser cutters; 3D printers; and more. Eric Wilks, supported by SAIL counselors, led high schoolers to design passive speakers for cell phones. They brainstormed possible designs, then chose, as a group of 20 (per week), which design to make. Wilks created a SolidWorks model. The group reviewed the model and modified if necessary. Then each high school student would print two designs, keeping one of the speakers while the other was sold in a summer pop-up shop in downtown Eugene! "Part of what was fun for me was going back to the wonderment of product design," explains Wilks, a junior. "For a lot of young people, product design isn't on their radar, so being able to see the excitement from these students was exhilarating. The energy they had was unique. On Monday, none of the students really knew what product design was and by Friday, 90 percent of them wanted to pursue it as a career! It gave me the chance to see product design through fresh eyes. I am excited for the future." "We wanted to be a part of UO’s SAIL program because it is so well-run and has such a fantastic reputation," says Associate Professor Kiersten Muenchinger, IDSA, head of the Department of Product Design. "We're committed to K–12 outreach, and SAIL adds an important summer camp piece to our Unparalleled workshops and Product of Eugene mentorship programs that occur during the school year." Lara Fernandez is the executive director of SAIL. "When Kiersten called to offer not one, but two weeks, in a product design program, I knew immediately that this would be a hot topic for high school students!" she says. "It's a very interactive, hands on and progressive field of study with boundless possibilities for creativity which high school students thrive on." Fernandez says thanks to the support of Muenchinger and Wilks, SAIL's summer program is expanding to providing mentorship opportunities in collaboration with Lane Arts Council for high school students throughout the academic school year. "These amazing collaborations combined with their passion for teaching is changing the lives of young students. Two of my product design high schoolers now claim this will be their field of study in their future careers. 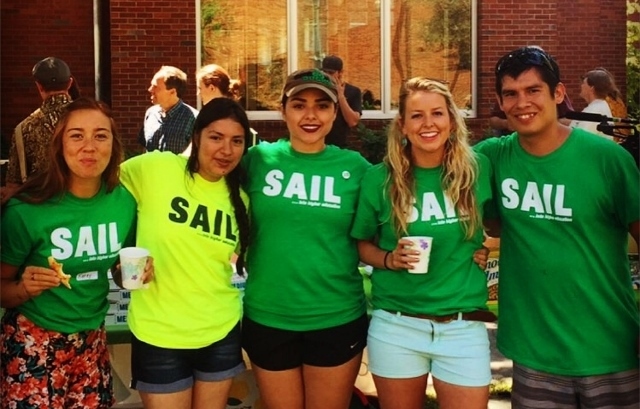 SAIL is proud to open doors to so many with the enthusiasm made possible by our participating UO departments."